We eat eggs all the time. We have several hundred egg layers on the farm at any given time..we order more peepers on a regular basis and grow them for the 6-7 months it takes until egg production commences. We love a mix of the old varieties of laying hens..right now the flock looks like mostly Plymouth Barred Rocks, but that is only because there are Cuckoo Marans in there too. 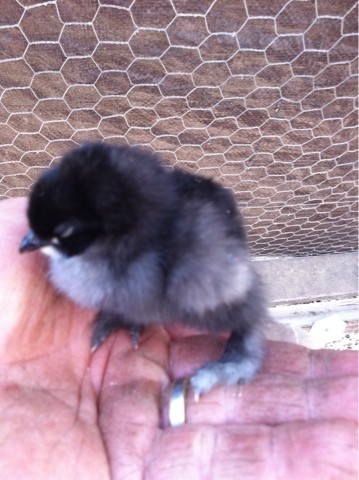 The Marans look very similar but lay a very dark brown egg. Some of the old breeds are flighty..the Buff Anconas, Minorcas, brown Leghorns and Sicilian Buttercups lay white eggs and stay on the small side..and are hard to catch and coax back into the pens. The Arucanas lay the blue and green eggs..we have some that are 4 years old and they are starting to look a little rough..so far, in almost a decade of egg production we have rarely processed a laying hen for the stew pot..it seems they self sort..the hawk or something gets them. The dog has learned not to bother a full size hen..but the baby chicks are another story. We continue to work on the "leave it" command..difficult for a Jack to obey when the small ones are darting about at her feet..but we are getting there! Yesterday the post office delivered 100 egg layers. We ordered an assortment and were happy to see this little, feathery legged gal in there..we do love a mixed up flock, no question about it. And the eggs?! Ridiculous good. Tasty, gorgeous and full yellow yolks.